Some of the least complicated chocolates are indeed the best. Nougatine slivers dipped in premium chocolate fall in this category. They are a perfect accompaniment to espresso and are equally fantastic when chopped in pieces and added to gelato. It is always hard for me to decide, if I prefer the slivers or éclat dipped in milk or semi sweet tempered chocolate. Dipped in milk chocolate you will taste the essence of the almonds better, in dark chocolate the caramel notes will shine. When I temper milk chocolate for nougatine slivers, I will add 15% dark chocolate to enhance the cocoa flavor in milk chocolate. Nougatine contains similar ingredients and is made in a comparable fashion as brittle but the major difference is that it does not contain baking soda. In brittle, a small amount of baking soda is used to aerate the candy and make it stand up to humidity better. The downfall of baking soda is that it steals away delicate caramel and vanilla flavor notes. This particular recipe for nougatine is made with pure sugar and without the standard addition of corn syrup or glucose. Either dairy or cocoa butter can be used, but dairy butter gives an unsurpassed flavor to nougatine especially when paired with vanilla or orange. Using a small amount of fleur de sel is essential to balance flavor and to make it impossible to have just one piece. Set aside a silpat and a rolling pin. If using a wooden rolling pin, butter it lightly. Not necessary if using a silicone rolling pin. In a saucepan bring the sugar and water to a boil. Wash away any sugar crystals adhering to the side of the pan using a brush dipped in water. Additional water obtained in the pan from this process will not alter the final product. Remove from heat, immediately add the toasted almonds, vanilla bean seeds, butter and fleur de sel. Stir to combine with a heat resistant or wooden spatula. Scrape the nougatine onto the silpat. Let sit for a few moments and then start gently rolling the nougatine into a thin sheet. If the nougatine hardens before it is sufficiently thin, keep it on the silpat and place it in the oven to slowly soften. Press with a finger to check if it is soft enough and then roll once more. When cold break into slivers. Temper chocolate of choice. Tempering chocolate can be found on this site. 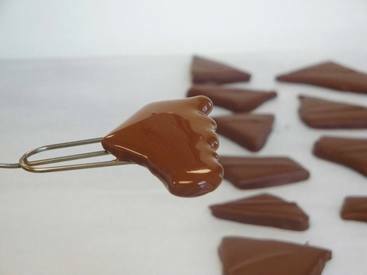 Dip the nougatine slivers into tempered chocolate using a chocolate fork. Store airtight.